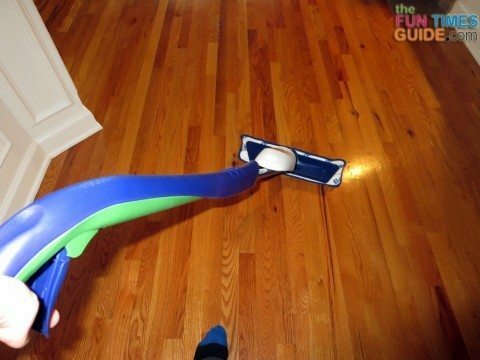 Bona Motion Mop Review: Is It Better Than The Regular Bona Hardwood Floor Mop? Recently, I bought the newer Bona Motion mop — only because it was at a clearance price that couldn’t be beat. Some might like to hear what the differences are between these two spray mops. The big question: Is the battery-powered Bona Motion mop better than the original Bona mop? We have hardwood floors on the entire first floor of our home. I rarely use the vacuum anymore — only for the bedrooms, which are carpeted, on occasion. 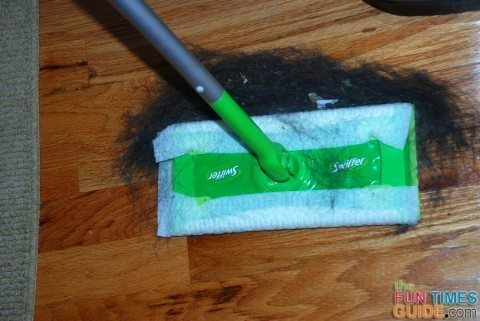 Instead, for the main living areas of our home, I first use the basic Swiffer Sweeper with the dry Swiffer cloths to pick up all of the dust and loose dog fur. Then, I immediately use the regular Bona mop to remove set-in dog slobber from my hardwood floors and make them look squeaky clean again. I do this about once a week (sometimes more). For what it’s worth, my dog salivates like crazy any time he’s expecting a treat! Yes, he gets plenty of treats throughout the day. And if I don’t get to the dog drool right away with a paper towel or something (which I never do), then I’ll have to deal with the set-in dog slobber later. Think slightly gummy water rings. That’s where the Bona mop comes to the rescue! For years, the regular Bona mop has met my needs like a charm. No complaints at all. Then one day, I saw the Bona Motion mop on clearance for $9.99 at Target …with a full-size refill cartridge of the cleaner included. Since that’s how much the Bona refill cartridge alone costs, I knew I couldn’t go wrong trying the new Motion mop at this price. At least I’d get a whole new cartridge of the Bona cleaner, even if I didn’t like the Motion mop at all! You get a better workout while mopping, since it’s a little bit heavier and takes more forceful movements to use than the regular Bona mop does. It’s super easy to turn the agitating mop head on and off with your toe. Thanks to the agitating mop head, this mop removes set-in water drops and dog slobber with slightly less effort than the original Bona mop. It’s kind of heavy compared to the regular, non-battery Bona mop (5.8 lbs vs 3.1 lbs). The mop head tends to flip up while mopping (see picture immediately above) when you’re using long, fast strokes — like on wide open areas — and you’re pulling the mop back toward you. This is simply due to the weight of the mop head now with batteries in the compartment. You have to mop a little slower. With the Bona regular mop, I tend to mop rather quickly — with fast, long strokes. But with the Bona Motion mop, it’s better to slow down a little bit in order to get the benefits from the agitating mop head. Let that agitation do the work for you! 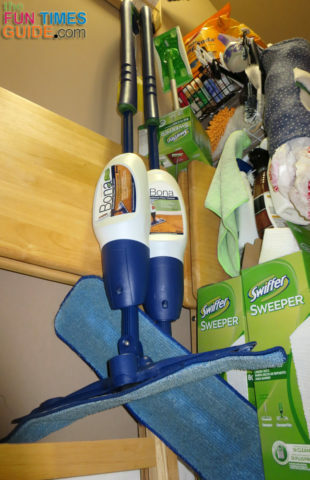 So, after having experience with both of the Bona mops now, I cannot say that I would recommend the battery-powered Bona Motion mop over the regular Bona mop to a new spray mop user. The benefits simply aren’t that numerous. But I would recommend either Bona hardwood floor mop over most other spray mops (especially the Shark) when used for cleaning hardwood floors. Here’s why. The biggest downside to the Bona Motion mop, in my opinion, is the fact that it is heavier than the original Bona mop (5.8 vs 3.1 lbs). When you have to do a lot of pushing and pulling, you don’t want heavier. You want lighter. The regular Bona mop is just the right weight. It’s not too heavy at all for routine floor cleaning. The one and only circumstance when I think the battery-powered Bona Motion mop is advantageous is with lots of dog slobber and/or set-in water stains. It actually does make those types of water marks easier to remove. 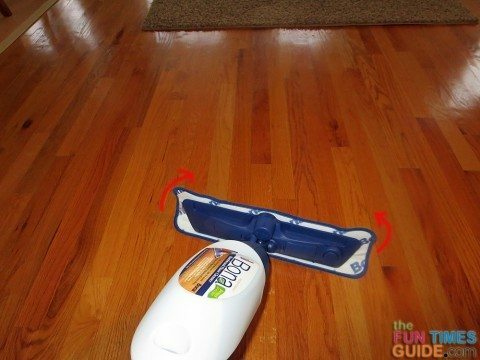 It requires less manual effort on your part, so you don’t have to push the mop over the same area again and again to remove those types of spots on hardwood floors. The minor amount of agitation that the Bona Motion mop provides is just the right amount for making the job faster and easier than using the regular, non-battery powered Bona mop. So if you primarily use your Bona mop to remove dog slobber and set-in stains, the battery-powered Bona Motion mop might be the best option for you. That said, when I’m cleaning my hardwood floors I definitely won’t be reaching for the Motion mop first — even though dog slobber is the #1 thing I’m mopping up all the time! Nope, I’ll still use the regular Bona mop most of the time — because it’s so much lighter, and quicker, and easier to maneuver. The only time I can see myself choosing the Bona Motion mop first is if I’ve let more than a week go by without doing any mopping. That would mean there’s probably a lot of set-in dog slobber on my hardwood floors, so the agitating mop head would be more appreciated at those times. You can see — and hear — the Bona Motion mop in action in this video. I’d love to hear your thoughts about the regular Bona hardwood floor mop or the Bona motion mop. What do you like best?… or least? Is there another spray mop that you recommend?